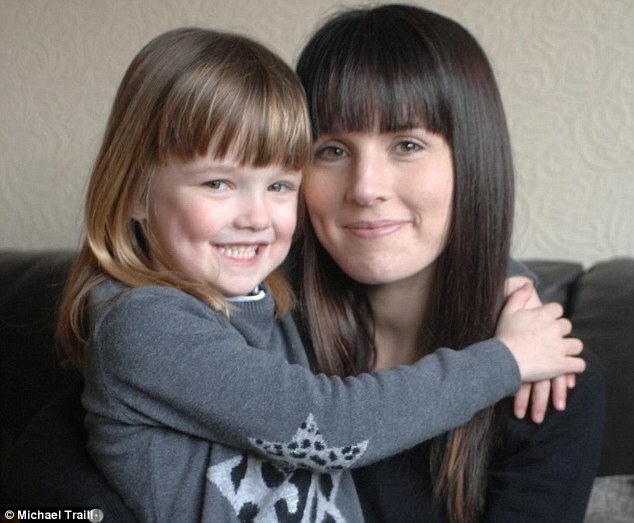 A girl who was given no chance of survival before she was born has stunned doctors by growing into a healthy six-year-old. Kaylyn Fry weighed just 1lb 11oz when she arrived 14 weeks early following a range of life-threatening complications in the womb. 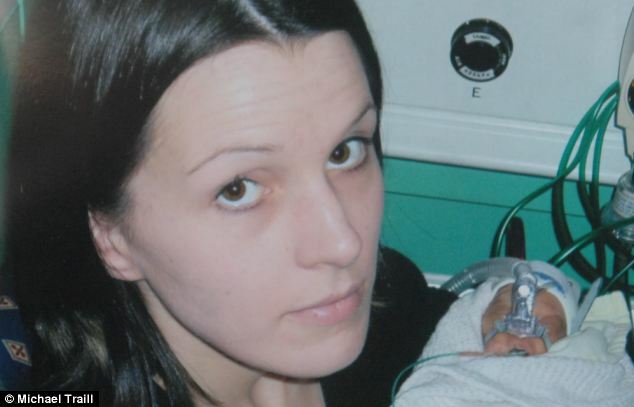 Her devastated mother, Ayla Blaikie, 28, was even told where she could bury her child after the placenta ruptured just 16 weeks into her pregnancy. The complications continued and Miss Blaikie’s waters began to leak at 21 weeks. She also needed eight blood transfusions, and contracted life-threatening infections group B streptococcus and MRSA – both of which were passed on to her unborn baby. Blaikie he had never see a baby born alive following so many problems. Now aged six, Kaylyn, who was expected to be blind and brain damaged and who spent three years in and out of hospital with chronic lung conditions, is a picture of health. She has even taken up Tae Kwon Do. Miss Blaikie, from Eyemouth, Scottish Borders, said: ‘Kaylyn was definitely meant to be here. 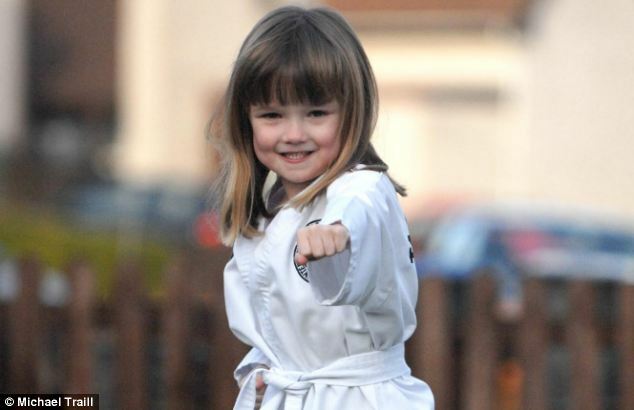 She’s a little fighter – literally. After her birth, Kaylyn spent four months clinging to life in two different hospitals, in Newcastle and Edinburgh. 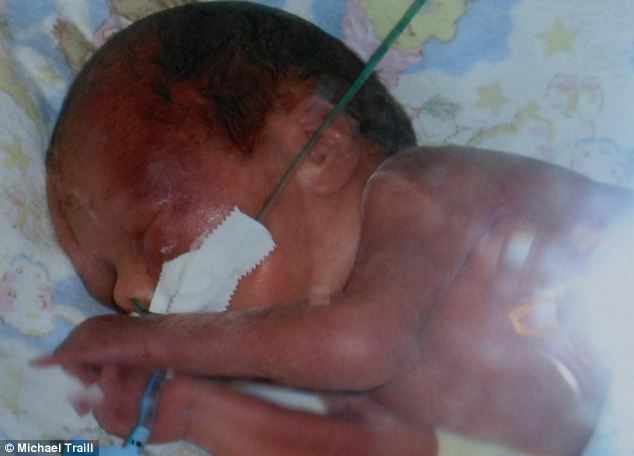 Weighing just 1lb 11oz, she was so small her mother could cup her tiny body in her hands. But despite her minute size, Kaylyn – whose middle name is Hope – put up a big fight as she battled a bleed on her brain, superbug MRSA, and group B streptococcus, which affects just one in 2,000 babies. The bacteria is found in one in three women and normally has no effect on babies. Kaylyn also spent a week on a ventilator, had a hole in her heart and needed three blood transfusions. 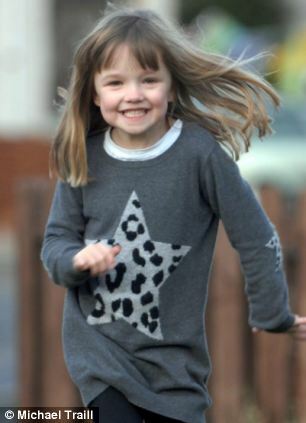 Even when she was allowed home from hospital after 16 weeks, it was feared she would be blind. Her parents also had to be trained how to resuscitate Kaylyn, who spent a year on oxygen, as her lungs were so underdeveloped. But the youngster, who has also battled countless chest infections and pneumonia, has astounded medics and her parents with her incredible resilience. And as she approaches her seventh birthday next month, Miss Blackie said: ‘Every time it’s her birthday it reminds us of how lucky we are. ‘All though my pregnancy I was constantly being told that they didn’t think she was going to make it. I was even told about the cemetery for babies who didn’t survive. It was really upsetting. ‘Even when she was discharged from hospital after almost four months she was showing no signs of being able to see at all. She had to be seen by an eye doctors for a year. That was one of the biggest worries. Miss Blaikie and Kaylyn’s father, Michael Fry, 38, were originally told she was suffering a miscarriage when she started to bleed at 16 weeks. And for the next seven weeks they were regularly told the pregnancy was not going to last 23 weeks, when there would be a slim chance Kaylyn would be able to thrive outside the womb. 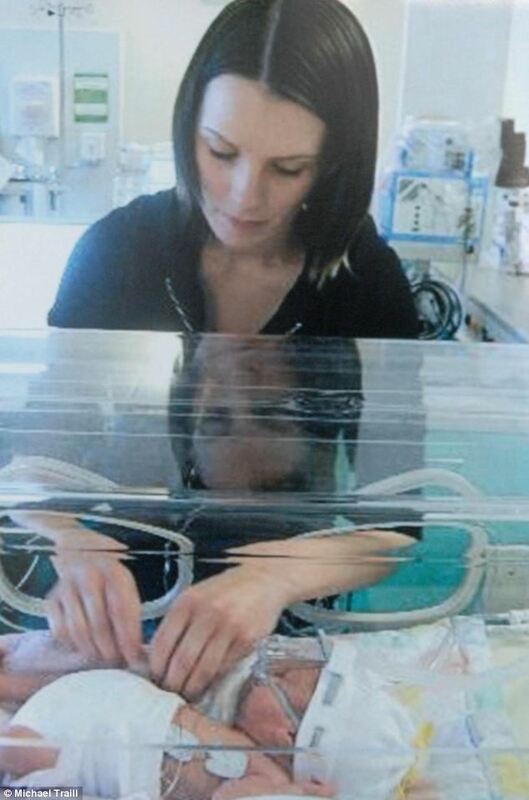 But against the odds, at 23 weeks Miss Blaikie, an adult nursing student, was transferred 70 miles from the Borders General Hospital to Newcastle, where Kaylyn arrived three weeks later. Recalling what happened, Miss Blaikie said: ‘I was in the labour ward regularly because of the contraction pains I was getting. But nothing happened. Then when I was in the antenatal ward one day I stood up to go to the toilet and she was basically there. ‘She wasn’t at all where she needed to be and they had to wrap her up in tin-foil and rush her to the resuscitation room. 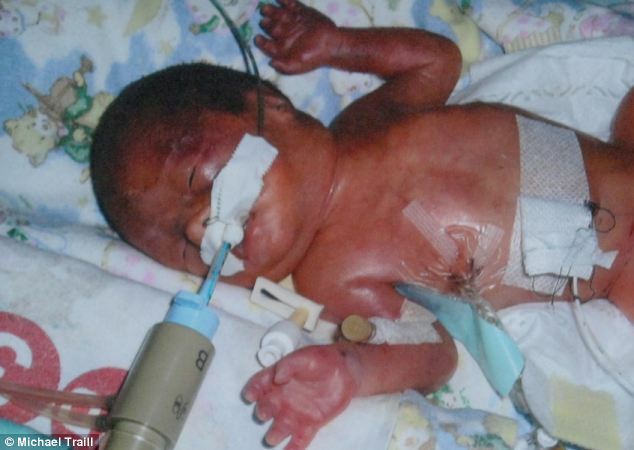 The doctors had to resuscitate the tiny newborn and insert drains in her lungs to give her a fighting chance. Miss Blaikie said: ‘When we finally got to see her she was really red and there were loads of tubes, monitors and beeping and every time we heard a beep I began to panic. But after a week on a ventilator she was well enough to be transferred from Newcastle’s Royal Victoria Infirmary to the Simpsons Maternity Unit at Edinburgh Royal Infirmary, where she spent the next 15 weeks. Miss Blaikie said: ‘I spent weeks sitting by her incubator. She was so small. I remember her hands were absolutely tiny, but totally perfect. ‘After she was born her weight dropped to 1lb 6oz but by the time we got out of hospital she was 7lb. ‘She had quite a lot of problems until she was about three years old. But now nothing is holding her back. ‘When she first started school I couldn’t believe it. Not just that she had survived, but that she had no disabilities and was able to go. It was really an emotional day.